Aunt Lorraine's Law | Levisay Consulting, Inc. Aunt Lorraine's Law | Levisay Consulting, Inc. There are so many instances in life where the challenges we face seem insurmountable. Think about challenges in your work life, or in your family. So often the issues/problems seem so big that all we can do is “admire” them from afar like some distant mountain range never to be crossed. If you consider the immense financial “mess” that this country (and the world) are struggling through, it is natural to wonder where to start to try to make things better. Many times in my life I have been faced by this exact feeling and have often thought back to a lesson from my Aunt Lorraine. (story and recipe follows!) I have shared this story so often in my work that I have heard it told back to me by someone who didn’t have any idea that Aunt Lorraine was actually my Aunt! There is no fonder form of flattery for a storyteller that to have his or her story retold to them! Once you’ve read through the story, don’t forget to try the recipe, it’s a real treat! Aunt Lorraine’s Law Well, I’m not sure where to begin when it comes to my Aunt Lorraine. It’s impossible for me to describe my earliest memories of Lorraine. I remember her as a small boy splashing with me in the waves of Jones Beach, on Long Island, New York, or maybe on my annual visit to Nunnally’s, a bigger than life “Amusement Park” near her home in Baldwin, N.Y. To say Nunnally’s was an “Amusement Park” might possibly be a touch of exaggeration. It was a park, I guess about the size of a city block (Maybe smaller, I’ll never be sure) with a great carousel inside of an old wooden building (barn), a small metal “clankety” roller coaster with a few other rides. My high point was always the same, the pinball machines inside of the carousel barn. I would bring my savings, you know $2.75 in dimes, nickels and quarters. Before you knew it, I was out of my savings and trying to mooch quarters off of Lorraine, my grandparents, my parents or my sister, Alice. (Attempting a loan from my brother Mark was beyond folly!). I was always the “spender” of my siblings and Alice could only be viewed as the 180 degree opposite. I’m certain that while she might not have the first dime she ever made, it is certain that my requests for “pinball loans” fell on deaf ears. Anyway, back to Aunt Lorraine, considering her a major influence in my life would be an understatement. With my mother’s early death, my mother Arline, Lorraine’s only sister, passed from us in 1974 at the age of 43. Lorraine played a role of family connectivity, friendship and stability that will always remain underrecognized. She spent 25+ years commuting into “The City” (N.Y.C). Waking up just after 5 am to make the train in time to be in the office well before 8:30 am. I remember as a college student thinking that I would NEVER have a job that would require me to ever set an alarm clock at such an ungodly hour. Well even though my alarm each workday is set at 5:50, I’m still a good 3050 minutes later than Lorraine’s everyday wakeup call from her working days. Well, as you can see Lorraine has been a big force in my life but I have skipped the fact that she is a great cook and an even better baker. There’s a little treat of hers at the end of this story that I would certainly encourage you to try. Now, on to her “law”. When I was a young boy, six or seven years old, I was quite a picky eater. While it’s impossible to tell that from my current plight as a great lover of all foods (well almost all), I was a pretty scrawny boy. In thinking back to those days, I have no recollection as to what new food she was trying to introduced to my palate…maybe flounder, broccoli, liver or maybe peas, but I remember the moment distinctly when Lorraine leaned over the table to say…”William, take small bites and chew thoroughly.” With that simple rule she was confident that I could finish whatever was on my plate. I am pretty sure that to this day my dear aunt would completely deny that these words were hers, or that there was such a thing as “Lorraine’s Law”, but I am here to ensure that the tale is told. I can’t describe how many times, in how many meetings or situations where I have used that phase, Lorraine’s Law, to help us through a difficult moment. It is often the case that things seem too big to handle, too difficult to resolve or too complicated to decipher. It is exactly those moments that I remember that voice of admonishment…”Remember, William, take small bites and chew thoroughly.” So true at the table, so true in business, so true in life! Lorraine’s Law is a construct where too concepts make up the whole. The first concept focused on how you approach the issue at hand, the second concept is how you process it once approached. So often in our hectic, over scheduled work lives we do the opposite of Lorraine’s admonition. In our haste to attack a problem or situation we so often try to handle the whole at once, in one fell swoop trying to understand, diagnose and resolve an issue rather than even taking a moment to decipher the nature of the problem or situation at hand. In baseball parlance, swinging for the fences every time at bat rarely leads to a successful batting average. On another hand at times the complexity or scale of a challenge may intimidate us to such an extent that we have no clue where to start, choosing instead to circle the issue procrastinating a beginning. Neither the naïve, oversimplified “dive right in” approach nor the tentative intimidated tone is right. Remember….”take small bites”. The second concept is also important, “chew thoroughly”. Once the problem has been approached, now what should we do? Rarely a good approach is to try to “swallow” the problem whole. The only certain result of that voracious approach is a certain commercial “stomach ache”, never leading to a productive outcome. Work the problem at hand, assess from all angles, and identify primary plans and possible contingency plans. Anticipate potential competitive responses and preplan response strategies. Again, “chew thoroughly” through the situation, take some time, the results will be worth it! Connecting the two halves should now be elementary. When approaching a significant challenge, first pause, take a deep breath and think of my Aunt Lorraine. Don’t try to solve the issue in a single action nor be intimidated in thinking the challenge too large. Take a “small bite”, start working the problem and once begun “chew thoroughly.” I think if you can keep “Lorraine’s Law” in mind as you encounter problems and challenges, whether in a professional setting or not, you will be amazed at how this little piece of wisdom can be so helpful. What follows is quite a treat! 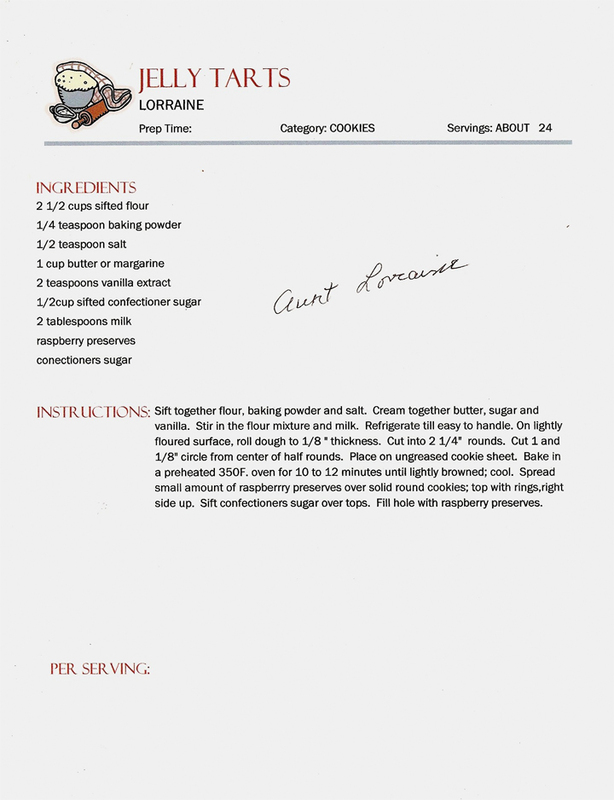 Aunt Lorraine is quite a baker and a few years ago I convinced her to share one of my favorite treats, her Jelly Tart recipe!!! What makes this so special is that in a moment of weakness, I had her sign the recipe for posterity. « “Put it on the Wall”	» “PBR”… Maybe not what you think!